1. Preheat the oven to 220˚C, gas mark 7. Put the sliced courgette and aubergine in a large bowl and add 2 tbsp of oil and seasoning. Toss together to coat and arrange on 2 oiled baking sheets large enough to take all the vegetables. 2. Bake for 20 minutes, turning halfway through cooking, until the vegetables are tender and golden. Add the halved tomatoes for the final 5 minutes. 3. Meanwhile, mix the crumbs in a bowl with the garlic, parsley and Parmigiano Reggiano. 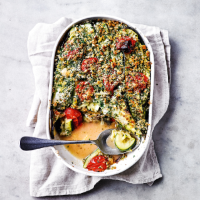 Layer up the roasted vegetables in a gratin dish with the mozzarella slices and oregano. Spoon the crumb mixture over the top and drizzle with the remaining oil. Return the dish to the oven for 10 minutes until the top is golden and the vegetables are tender. Serve with ciabatta.